Discover the scenery and light that inspired countless artists. The art of living is alive and well in this hotbed of food, wine, and natural beauty. Explore picturesque terracotta villages, shop for epicurean treasures in the local outdoor markets, taste the local wines, and linger over some of France's best cuisine. Stay in a charming apartment in the countryside. Day trip options: Avignon, Aix-en-Provence, Arles, Gordes, Marseilles, Nîmes, Orange, St. Rémy, Vaison-la-Romaine, the Pont du Gard and more! Day trips: Avignon, Aix-en-Provence, Arles, Gordes, Marseilles, Nîmes, Orange, St. Rémy, Vaison-la-Romaine, the Camargue region, the Luberon Mountains. Sightseeing: Les Baux (Old and New Town), the Pope's Palace in Avignon, the Pont du Gard (Roman aqueduct); the Roman arenas of Arles and Nîmes; the Abbaye de Sénanque and its lavender fields; the pink flamingoes, white horses and black bulls of the Camargue, Mont Ventoux. Off-the-beaten-track attractions that can't be beat: Tasting the heady red wines of Chateauneuf-du-Pape with the fourth-generation vintner; Crestet, a quintessential hillside town known only for oozing Provençal charm; the gregarious vendors of Isle-sur-Sorgue's Sunday market; outdoor displays of olives prepared in dozens of ways; plucking the world's finest melons in the fields outside Cavaillon; going the extra mile because the best bread and the best croissants don't always come from the same place; picking your own "herbes de Provence" in the garrigues; following Vincent van Gogh's footsteps in St. Rémy. One or two weeks in a personally selected apartment in the scenic French countryside. Transfer assistance for airport arrivals, or detailed instructions that allow you to reach your apartment with ease. 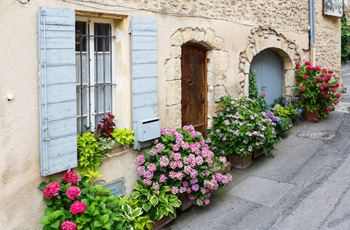 Local information, a regional map, and the Untouring Provence guidebook, researched and written by Untours staff, full of insider tips and day trip information. A local cultural event, like a traditional French meal at a local restaurant. ""We loved everything! Great value for an awesome experience." Marvin & Diane Levake"